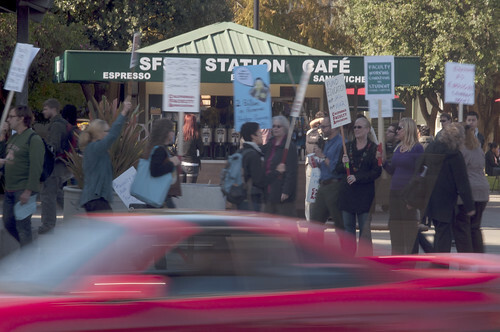 Faculty members and students participate in an informational picket organized by the California Faculty Association Nov. 8 at SF State. The picket was organized to call attention to a CFA strike Nov. 17. Photo by Gregory Moreno. Spirits were high as SF State students joined members of the California Faculty Association in informational picketing today about the one-day faculty strike Nov. 17. Teachers and students marched along 19th Avenue from 11 a.m. to 1 p.m. to call attention to the discrepancies of the CSU system and faculty working conditions. The CFA Board of Directors voted in support of the strike by 93 percent Monday. 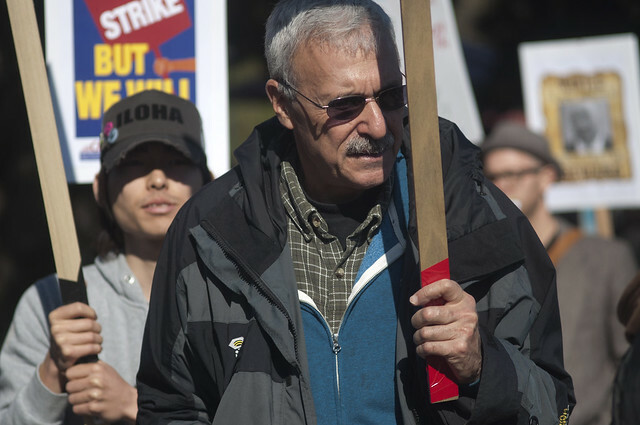 Striking will take place at the Cal State East Bay and Cal State Dominguez Hills campuses, with some universities hosting their own events. Dariotis is an Asian American studies professor who has been at SF State for 12 years. She said that the CFA members are working in solidarity with other campus workers to create better working conditions for teachers, librarians, lecturers, coaches and other faculty. The CFA Board of Directors is in the process of negotiating a new faculty contract with the CSU Board of Trustees, led by Chancellor Charles Reed. The CFA is currently working under an extended 2007 contract, but renegotiations began after the CSU withheld a salary increase due to the budget crisis. Both sides have yet to reach an agreement. Some students also joined the picketing in support of the faculty. Some CFA members marched in a circle, holding signs and chanting in unison, while others distributed informational flyers. Students were encouraged to join, such as Jennifer Chadwell who was eager to support the rights of teachers and students, but didn’t know if progress could be achieved through picketing. Students and faculty participate in an informational picket organized by the California Faculty Association Nov. 8 at SF State. The picket was organized to call attention to a CFA strike Nov. 17. Photo by Gregory Moreno. 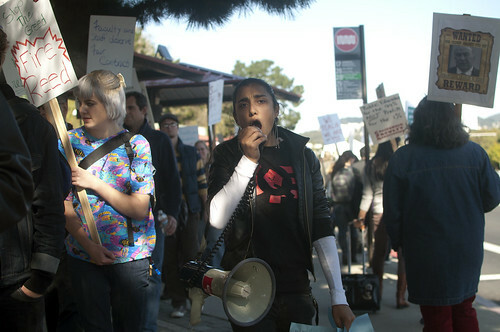 An SF State student leads in a chant during an informational picket organized by the California Faculty Association Nov. 8. The picket was organized to call attention to a CFA strike Nov. 17. Photo by Gregory Moreno.